Triple jumper Osamah Alshanqiti won Saudi Arabia its first gold medal in Paralympic history with a record-breaking jump of 15.37m. "I am happy, I am really really happy because I made this on the last jump," said the 32-year-old after surging ahead of Ukrainian Ivan Kytsenko, who was in the lead after the first five jumps in the F12 classification. "I do not have any special tactics and I just do it step by step with patience. The fifth jump is the key jump for me, and the last one is the explosion of my force. "My whole country will celebrate together with me. The gold is for the whole country, not for me alone. 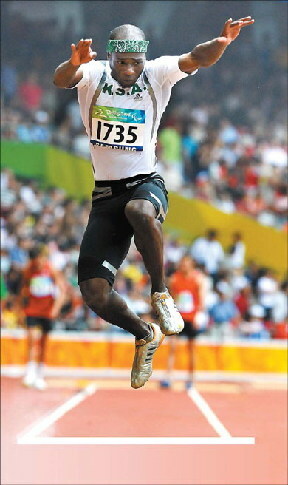 Today's match definitely gives me much confidence for my next event, the long jump," said Osamah. Osamah was already a triple- and long-jump athlete when he sustained an injury to his eye in an accident in 2000. He began his Paralympics career in 2006.